Clinging to the east coast of the Black Sea and tucked into the southern folds of the craggy Caucasus, the Republic of Georgia is a lush, mysterious land. Despite being no bigger than Ireland, the country’s frontiers encompass everything from subtropical rainforest to alpine glaciers to desert plains, and thanks to its strategic location along the fabled silk road to Asia, has played host to travelers, traders and tourists alike for the better part of a millennium. Unfortunately, Georgia is better known these days for its turbulent recent history, and has achieved more than its fair share of notoriety for being the birthplace of the Soviet Union’s most despised and tyrannic despot. Finally though, fifteen years after regaining its own political identity, Georgia is beginning to emerge from the shadows of its past and is being recognized for what it really has to offer. This is, of course, its cuisine. There are two legends that Georgians tell to explain the creation of their country, and fascinatingly, both involve food. In the first, the Georgians claim that when God was distributing land to all the peoples of the Earth, they were too busy feasting and drinking to show up at the appointed time. When they finally arrived, they were dismayed to learn that all the land had already been given away. They explained to God the reason for their delay, and God, obviously recognizing the value of a people who would rather be feasting than fighting over land, took pity on them and gave the Georgians the part of the Earth that he had been reserving for himself – naturally, the most beautiful part. In the second legend, God took a supper break while creating the world, and became so involved with his meal that he inadvertently tripped over the high peaks of the Caucasus, spilling his food onto the land below. This land blessed by heaven’s table scraps was Georgia. I bought my first cookbook on Georgian cuisine on a whim; since I pride myself on the breadth of global coverage contained on my bookshelves this seemed like an obvious gap to fill. I had never actually had Georgian food, I didn’t even really have an idea what might set it apart from the cuisines of its more well-known neighbors, including Turkey, Russia and Iran. I imagined it must be some kind of pan-Eastern European/Middle Eastern fusion where you might get dumplings and beetroot with your shashlik. Why else would it be so obscure? I had barely finished the book’s introduction, however, before I was convinced I had just stumbled upon my most exciting culinary discovery of the decade. Precious few books on Georgian cuisine exist in the English language. Paula Wolfert devotes some of her excellent Cooking of the Eastern Mediterranean to an exploration of Georgian cuisine, arguing that despite the fact that the country doesn’t touch the Mediterranean, it is in flavor and spirit similar enough to deserve an honorary inclusion. Darra Goldstein, whose book The Georgian Feast expertly combines anthropology, history and a comprehensive gastronomic survey of the country, is the one who best sums up my own impressions: "Georgian food is reminiscent of both Mediterranean and Middle Eastern tastes, the result of a rich interplay of culinary ideas carried along the trade routes by merchants and travelers. Today their cooking represents more than a melange of the flavors of other regions. Georgian cuisine stands distinct among the foods of the world, a vibrant, inspired interpretation of indigenous ingredients." The thing that appealed to me instantly about Georgian cuisine is both its familiarity and its exoticness. The foundations of the cuisine are all well known to the European palate: hazelnuts, walnuts, cheese, yogurt, plums, corn, peaches, apples, cherries, cilantro, basil, tarragon, dill, mint, cinnamon. What is not familiar are the preparations: beets with sour cherry sauce; beans with pomegranate and fenugreek; eggplant with walnuts and saffron; chicken with cilantro, dill and plums; rice with raisins and honey. It’s as if the familiar flavors of Europe had been handed to someone who was instructed to forget everything he knew about the continent’s gastronomic heritage and instead reinvent the wheel, which somehow he managed to do with subtlety, sophistication and finesse. Perhaps the most iconic Georgian dish, and the one I was eager to try first, is a savory cheese bread called hachapuri (or khachapuri). 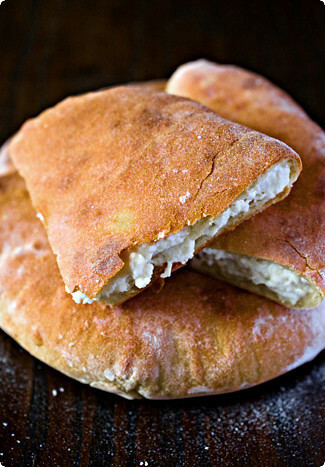 The dough for this bread is traditionally unyeasted, instead leavened with baking powder and soured with yogurt, and the cheese inside is either the soft, crumbly imeruli, or in the western part of Georgia, suluguni, a creamy, slightly rubbery cheese akin to a ripened mozzarella. It’s purposefully quick, so that it can be whipped up in a hurry when unexpected guests arrive, and rich, so they won’t leave hungry. Strangely enough, I found the most compelling recipe for this dish in Nigella Lawson’s most recent book, Feast, in which she dedicates a full chapter to her enchantment with Georgian food. What captivated me about Nigella’s version was its background story. She recounts how she first tasted an extraordinary hachapuri one night in a Georgian restaurant in St. Petersburg, an experience which prompted her to spend the next several years trying to duplicate the recipe. After dozens of failed attempts, she says she stumbled into a Georgian cafe in East London by chance, ordered a cheesebread, and had a truly Proustian moment as she came face to face with exactly the bread she had been trying to recreate. Her recipe is called Nana’s Hachapuri, after the kitchen matriarch of that small cafe who consented to allow Nigella to witness and document the recipe for the best cheesebread this side of St. Petersburg. I can’t say tasting it caused a Proustian moment for me, but rather the opposite: upon first bite I saw, stretching out before me, the vision of many, many Georgian feasts to come. Notes: A possible variation that I learned from Wolfert’s book, and one which I intend to try next time, is to substitute equal weights of feta and fresh mozzarella for the three cheeses Nigella suggests. This apparently more closely resembles the highly-regarded hachapuri from Mingrelia, in Western Georgia, which is made with the coveted suluguni cheese. In a large bowl, stir together the yogurt, eggs, butter and salt. Begin adding the flour, a cupful at a time, stirring or working with your hands to form a silky, soft dough. Add as much flour as is necessary to bring the dough to a kneadable consistency – it should not be overly sticky. Knead in the baking soda. Although Nigella doesn’t mention it, I would recommend turning the dough out onto a floured surface and kneading lightly for a few minutes – this activates the gluten in the flour and will make the dough less prone to tearing when you form the breads. Wrap the dough in plastic and refrigerate for at least twenty minutes, or up to a day. For the filling, chop or mash all the cheeses together in a bowl. Stir in the egg. Preheat the oven to 425F/220C. You can either make six small hatchapuris or one large one. To make a large one, separate the chilled dough into two equal parts. Roll one of them out on a well-floured surface to a circle approximately 1/4-inch (1/2-cm) thick and transfer it to a baking sheet. Spread the cheese in the center to within an inch of edge. Roll out the second piece of dough in the same manner and place it on top of the cheese. Fold in the edges to seal in the outside of bread, curling them inwards to form a roll of dough. Press down on the roll with the tines of a fork, sealing the two layers together. Transfer the bread to the oven and bake until golden brown, about 20 minutes. To make smaller hachapuris like I did, divide the dough and the cheese into six equal parts. Using your hands, press each piece of dough out into a rough circle about 8 inches in diameter. I found that it was best to leave the center slightly thicker and concentrate on stretching out the sides, creating a kind of slim flying-saucer shape. Mound a sixth of the cheese into a fat disc in the center and start bringing the sides of the dough up around it, pleating them as you go (you can moisten the pleats with water to create a better seal). You should have a gathering of dough at the top when you finish – twist this around itself to seal. Now pat this cheese-filled dough ball out until it is about 1/2-inch thick. Bake for about 10-15 minutes. You can also cook this bread in a heavy skillet on the stovetop until both sides are golden brown. Cool the hachapuri slightly to let the cheese set, but eat warm. That looks utterly gorgeous – I’d really just like to stretch my hand out and take a piece! I love how the cheese is almost oozing out the sides. Lovely. Isn’t bread baking just the best? I feel like you can discover the entire world through the oven. Hi Melissa!what’s up?In addition to the fact that Georgian, as a language, is delightful – quirky in a great way, Georgian food is beautiful. We have several Georgian restaurants in Tel Aviv, the best one is a bar-restaurant named "nanuchka". several years ago, Israel’s leading culinary magazine "al hashulchan" ("on the table") did a feature on Georgian food, and took Nanuchka’s chef Marina to show recipes such as Hinkali (a kind of steamed meat-filled dumpling), pilaf, and several salads.Georgian cuisine is very rich in walnuts, herbs (especially cilantro), pomagranates, plums, and it’s spicy too with the use of fresh green chillies. yummy indeed.I took it upon myself to find more about this cuisine, and your article came at impeccable timing. I’m going to make Hinkali sometime soon. and of course Tkimali – the famous plum sauce which is to Georgians as Heinz ketchup is to Americans… wouldn’t that be great? oh, I almost forgot to add… you have to see the pottery produced in that region of the world – be it Bucharian, Georgian or Armenian. Such rich and vivid colors, patterns…everything about this cuisine and serving it is lush and lavish.As I said… *sigh* beautiful. Melissa,Whoa! That sounds (and looks) awesome! speaking of Georgian – check this out: the funniest thing:http://s5.yousendit.com/d.aspx?id=33TR4LBGQFAI32EI0Y8H6J04CAdownload or open the file called "renamed". you won’t regret it.it’s a very special version of "shrek". This looks beautiful and delicious. I love the little crack in the crust, you can absolutely imagine the thin crispness of the crust and contrasting softness of the cheese. Super (and subtle) photo. Isn’t is amazing how many cultures around the world have some sort of cheese/ bread combination? This looks very tasty, something I might try when I want a more wordly comfort food. I have really enjoyed your blog…you write beautifully. hey look at you cooking Nigella! No surprise that its Nigella considering the recipe is bread stuffed with cheese! Who can resist that? Your picture is fantastic, I love the look of the bread, it looks so hearty and rustic. It would be nice to mix in some herbs in with the cheese too huh. I know people say this all the time, but I really want to make this! Just another cheese sandwich – yet so passionate! :^) It makes think of tyropitakia, greek "cheese triangles" made with phyllo dough, only this version sounds healthier (not dripping with butter/olive oil) and easier to make. I’m going to have to try it! That looks very tasty, Melissa, although I’d better not make it.I think the oozing cheese filling might drip, and leave a stain on one of my new shirts. Hi Melissa! While in Russia recently John and I fell in love with Georgian cuisine. We purchased The Georgian Feast and had it waiting when we returned to Chicago. We have tried several recipes with pretty good results, but I have to say I was disappointed in the hachapuri. I eagerly anticipate trying the Nigella recipe you have included. Yours looks beautiful! I am in love with this posting! A bit of history, a big bit of deliciousness, it’s these reasons why I wait anxiously for new postings!I must admit that I think this site is just as good if not better than many food magazines out there. But I won’t mention any names :)I LOVE YOU! Mmmm, khachapuri. When I lived in Moscow there was relatively little food that, to my young twenty-two year old palate, tasted like heaven. This defied the odds and my friends and I gobbled it up from every market stall vendor we could find. When I found it in Feast, it was like a lightning bolt struck me still where I stood. I went running into the other room to share the good news (and memories) with my boyfriend. But did I ever get ’round to making it? Uh-uh. Thanks for the reminder to go fish Feast from the cupboards and give this a shot. oh my! that is so beautiful! Hi Melissa,You continue to amaze us. We’re such big fans. Thank you for yet another lovely post. hi Melissa ,it was such a pleasure to read your posting . I grew up eating khachapuri and it is so great to hear that something as simple as cheesebread creates that sense in other who are not from Georgia. I still long and crave my Mom’s or my Grandma’s version. to say it is so delicious one could eat their fingers would be true understatement.thanks for the posting.kate. P.S.It is incredible how small the world seems sometimes. I was recenty talking to someone In USA who often goes to " Nanuchka " in Tel Aviv. I am glad Marina was able to replicate the great taste of the cuisine there. hinkali is very tasty. Definitely one of the most delicious looking cheese sandwiches I’ve ever seen. Wow! I am incredibly impressed. What a fabulous piece – I love it! That sandwich looks fabulous and I love the piece! I’d say it exudes passion. hi melissaI love gread too. especially foccacia studded with black olives, sundried tomatoes and pesto! Yum! Thanks for visiting my blog and leaving that nice comment. Your blog is so wonderfully written. I really admire your work. Great recipe. It’s always a treat to find a good bread that uses bakingpowder instead of yeast. Spontanous baking right before dinner — that ought to be popular. Hi Luisa – It is indeed, and when it happens to be cheese-filled the discovery is all the better! ;)Hi Malka – You’re lucky to have a number of Georgian restaurants to choose from in Tel Aviv – unfortunately they’ve been kind of thin on the ground in places I’ve lived, or else I simply didn’t know where to look for them. Some day, though, I’ve vowed to taste the cuisine at the source. Thanks for the laugh with Shrek!Hi Kevin – Thanks!Hi J – Yes, I remember that conversation well! Pille is impressively well-versed about Georgian cuisine, and has even recommended a place in Glasgow where I could go to find the elusive suluguni cheese. I’ll have to look up that recipe for svaneti beef pie – now that the floodgates are open I’m planning to cram in as much Georgian cooking as I can!Hi Lindy – Thank you! Your observations from the photo are correct – the crust developed a lovely texture, soft and doughy on the inside and shatteringly crisp on the outside, as well as a very interesting, slightly sour tang from the yogurt. Like nothing I’ve made before!Hi Hag – Thank you very much! There seems to be some fundamental affinity between starch and cheese that appeals to people the world over. It certainly is one of the most delicious combinations in my book! :)Hi Michele – Ha ha, I knew that aspect would get your attention. My first Nigella recipe! In all honesty, though, I still don’t own any of her books – Pille loaned it to me. The woman does seem to know her way around a cheesebread, let me tell you! And I was thinking the same thing about herbs in the bread next time – our tastebuds are on the same wavelength!Hi Pille – Sounds like a plan! Perhaps we should bake up different samples to share? 🙂 I certainly wouldn’t mind an excuse to make it again!Hi Tricia – Now you’ve piqued my curiosity about tyropitakia, which I’ve never had. Perhaps that will be my next cheese-and-dough experiment!Hi David – I’m sure a little melted cheese would do far less harm to those shirts than you can do yourself with an errant pair of scissors! ;)Hi Gemma – Lucky you! I’m glad to hear it lived up to its reputation. Not having tasted the real thing myself, I would be very interested to know what you think of Nigella’s version of hachapuri. I considered making Goldstein’s recipe, but it seemed potentially very rich with all that butter, more like a pastry. Is that what you found? Welcome home, by the way!Hi Matt – Aw shucks, you really know how to make a girl blush! Coming from someone as talented as you, it means a lot. Thank you, my friend, for your generosity! :)Hi Catherine – I was always fascinated by your accounts of living in Russia, and on hearing about the abysmal quality of the food I must say I was glad I stopped studying Russian when I did, before I had the chance to experience it myself! I’m glad there was some light in your culinary life, however, and I’m happy to have inspired you to revisit it!Hi Fanny – I’m glad to hear you’ve had success with the recipe too. By the way, did you find that you had to add much more flour than she calls for? I certainly did.Hi Fiordizucca – Thank you :)Hi aj – Thank you, I’m touched. You know I’m a gargantuan fan of yours as well – I find myself buying every book you recommend!Hi Kate – Thank you for your lovely comment. Are you (or is your family) originally from Georgia? Hi Kalyn – Whoever knew I could find so much to say about a cheese sandwich? Thanks for a great excuse to write about my two favorite ingredients, bread and cheese! And thanks for your kind words :)Hi MM – Thank you!Hi Catherine – Thank you too!Hi Shaz – That does sound good!Hi Christina – I agree, there is something almost magical about whipping up a delicious bread in so little time! I hope you enjoy the recipe. Lovely as always, Melissa!I particularly enjoyed your account of Georgian lore! YAY to you! i regard georgian cuisine as one of the most beautiful and interesting. it is also one of the most unappreciated cuisine. good one!! Hatchapuri bake-off sounds great, Melissa:) I’ve got four recipes now – 2 from Estonian Georgians, one by Nigella and today Darra Goldstein’s book arrived in post..Faustian Bargain mentions several delicious dishes as well – hartcho spicy lamb soup is wonderful, and adjika is a great spicy condiment sauce worth trying. Hi Melissa. As everyone has said, that looks and sounds delicious. I live in East London – does anyone know whether the cafe Nigella mentions still exists and, if so, where we can find it? Jenni – Nigella says the place is called "Little Georgia" and it’s in Hackney in east London. According to Google that should mean 2 Broadway Market,Hackney London E8, tel: 020 7249 9070But then it also gave a link to an article in "hackney independent" in September that mourns the closing down of "the upmarket ‘Little Georgia’ restaurant". So it’s probably worth calling them first..
Hi Ivonne – I know, I love it too! They are obviously a people close to my heart :)Hi Brenda – Thank you!Hi Faustianbargain – I can’t tell you how much my stomach was rumbling by the time I got to the end of your notes! I have a lot more dishes now on my Georgian to-cook list. I’m curious, where did you get these snippets from – was this a meal you experienced?Hi Pille – I’ve got two more to add: besides Goldstein’s recipe, I have Paula Wolfert’s and Alford & Duguid’s in their book ‘Flatbreads and Flavors’. How does a taste test of six different versions sound?Hi Jenni – It does indeed look like ‘Little Georgia’ has closed, but a quick google has turned up two other prospective Georgian restaurants: ‘Tbilisi’ is at 91 Holloway Road, London N7 8LT, 020 7607 2536; and ‘Restaurant Erebuni’ at the London Guards Hotel, 36-37 Lancaster Gate, London W2 3NA, 020 7402 6067. If you check either of these out, please do give us a report!Hi Paz – I’m glad to hear it! Let me know if you try this recipe. Yes, that was what I found with the recipe. I wouldn’t make it again. However, I happened to try this one from Nigella’s the other day and I found it much better. I think I would cut down the cheese a bit (that is something I rarely say!). There are so many different kinds of Hachapuri that I have tasted, it is difficult to compare them. I think this is a perfectly respectable recipe though. I am on the hunt, so I will be sure to let you know if I find any others that seem worthwhile. hey again, M. one of my best friends is from georgia. i have also helped to cook some of those meals. and i use the term ‘cook’ very loosely here. those were meals from a happier time. to have a georgian cook for you is such a joy and to cook with them is a blast. and she has the bestest stories to narrate. every weekend, there would be some excuse to meet, eat and dance. i think georgians away from their home miss their land very much, but she has also reconciled with the sad fact that there is little more than a dim chance for success in her homeland. so she tries to recreate georgia with food for a multi lingual audience/participant crowd. hi melissa,what can i say that the others havent already said…. writing that’s personal but not boring, photos that make you want to whip out that apron right there and then. i just wish you had a new entry every day……And i find it quite amazing you reply to all the comments, wow.I tried your recipe over the weekend, and i must say it turned out…. quite differently, but delicious nonetheless!I found myself with dough that was really sticky and quite impossible to shape. Warning bells were going off in my head, but I went ahead anyway, and ended up with a very fluffy cake-like bread. It was almost scone-like, and I even thought of using the same base and adding sugar for some sort of tea cake another time. Also, keeping to the temperature recommended and even exceeding the time, mine were pale yellowish and puffy, and not that lovely bread-like brown. Truly, they were like puffs! They were almost too "feminine", if you know what i mean, for Georgian hachapuri ;))What do you think happened? ?btw, i substituted half of the feta with haloumi, works fine but prob less of a kick as haloumi is milder. I also ended up with quite a bit of leftover cheese filling, will use less the next time. Hi Gemma – I do know what you mean about the cheese, it is quite intense! It’s interesting to know what you thought of Goldstein’s recipe, as I was considering making it to compare. Now I think maybe I’ll hold out until you tell me you’ve found the definitive recipe 🙂 Hi Faustianbargain – It seems I need to find a Georgian to befriend! How wonderful that you have one who has opened your eyes to all this amazing food. Thanks for sharing your memories with us!Hi Greedy Fan – That’s very kind of you to say, and I must admit I too wish I had the time to post more often! If only blogging paid the bills… Anyhow, about the bread: I too was worried about the consistency after stirring in the recommended amount of flour, so I kept adding more until I had a much stiffer dough. Unfortunately I didn’t measure how much, but I might say up to 1.5 cups more. Also, I kneaded it quite well, which probably allowed me to pat it thinner without it tearing. The end result was definitely tender, and quite puffy in the thicker parts, but overall more bread-like than scone-like. If you feel like giving it another try, perhaps taking some of these modifications into account, do let me know if it comes out better for you! Wonderful blog- I’m new here but will definitely be returning! I just had to comment because I am such a fan of Georgian cooking. I discovered this amazing cuisine during a business trip to Moscow, and whenever I return I skip the Russian food entirely and head straight for Genatsvale, a Georgian restaurant on the Old Arbat. I finally made it to Georgia proper, and was not disappointed- the incredible flavor and variety of the food is exceeded only by the warmth and charm of the people there.Your commenter above is correct- I’m fascinated by the overlap between Caucasian cooking, especially Georgian, and Indian cuisine. I was in India in January and was served a bowl of sweet cheese cooked in milk- a dish that I’d thought was very specifically Georgian!I usually don’t like to promote my own blog, but I wrote a series of entries on Georgian cooking (with a khachapuri recipe!) in mid-December that might interest you.http://somewhereistan.blogspot.com/Thanks for providing such a great forum! Hi Rosa – I’m so glad it worked out for you, and thanks for letting me know!Hi Brunette – Thank you for your kind words, and again, I’m delighted to get feedback from someone who has tasted the food at the source. It makes me want to visit Georgia more than ever! I’ll have to look into this Georgia-India connection, since both of you have mentioned it – I hadn’t noticed it myself on first glance, but then again my experience is rather limited. And thanks for the pointer to your blog – I’ve bookmarked your posts on Georgia so I can give them the attention they deserve when I get a free moment. Hi Mellisa ,I hope all is well with you.Thank you for your care. It is incredible that you responed to the posts. I am Georgian and have lived in the States for a while now.I came across your blog by accident.I was feeling very nostalgic and searched for Georgian cuisine.long time ago i read small interview with Darra Goldstein. she has tried many Georgian resturants all over the world,but none were as good as the source.I come from the source and have to ardently agree.sometimes I dream about sulguni with mint souce and Gomi. or My Granny’s sacivi. I miss mchadi as well. the corn flower over there tasts so different.When i first came to US it took me a long while to get used to a different taste. It seemed everyting tasted so much better in Georgia, but then gain I was prejudiced. well I hope one day you’ll get to experience it there.I have to say you are an amazing writer and your passion for what you write always comes through. now I come and read your posts periodically.I am truly happy my search led me to this blog. keep up the good work. who knows perheps we ‘ll happen to be in Georgia at the same time one day. best wishes. I just discovered Svaneti Salt! Does anyone know this magic recipe and can share it? I just returned from my second trip to the Rep of Georgia. The first time I got this at a market in Tbilisi and just called it Georgian Seasoned Salt. This time I found it’s origin…thanks to my Georgian friends. I actually brought several ziplock bags and just cleaned out the vendors bowl of this salt. It cost me 15 lari. Or about 7 and a half dollars. I treat this stuff like gold! Yum! I love khatchapuri… I was first introduced to it while living in Moscow as a graduate student in the early 1990s… a friend and I would occasionally go to eat at U Pirosmani, a Georgian restaurant near the Novodeivichy convent in SW Moscow. I found another good recipe for it in Please to the Table, a wonderful cookbook compiling recipes from the former USSR countries. I can almost smell and taste it from looking at your post! Priyatnevo appetita! yes! i did it!! and it came out just like the picture. i didn’t have the cheeses so i used mince as a filling. but the result was great. AND i made the olive oil brownies as desert. thanks for the wonderful recipes. I saw a picture of hachapuri and it looks amazing. I must make it! (and eat it!) I’ve bookmarked your blog – can’t wait to try this. Hi Melissa, I was so excited to find your wonderful blog. I got here via "Sprouted Kitchen" when I was admiring the Spiced Lentil Soup with Coconut Milk, adapted from your recipe. I recently(just) started an international food blog and you are definitely a role model for me. Getting all the cultural background definitely enhances the cooking and dining experience! I can't wait to try this recipe and look forward to enjoying your recipes and stories. Does anyone know of a good Georgian Café in South Florida? Thank you for the article.